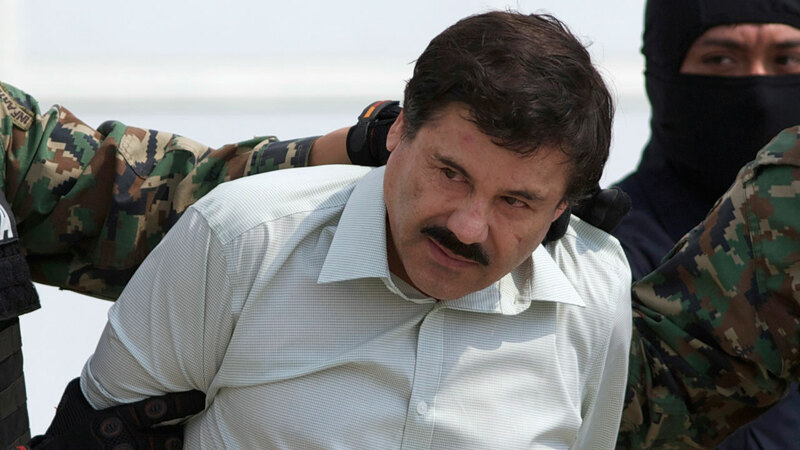 NEW YORK -- U.S. prosecutors and lawyers for Mexican drug lord Joaquin "El Chapo" Guzman are sparring over jail conditions that the lawyers claim are so stressful he's hallucinating about music. The claim was contained in a defense filing last week that asked U.S. District Judge Brian Cogan to order Guzman released from an ultra high-security wing of a Manhattan jail that's housed alleged terrorists and mobsters, and be allowed in the general inmate population and receive more visitors. The government fired back on Tuesday by arguing that the tough conditions - known as Special Administrative Measures - are appropriate for someone who escaped twice from prison in Mexico, including once through a mile-long tunnel dug to the shower in his cell. Prosecutors said that even while he was behind bars in Mexico, Guzman used coded messages, bribes and other means to control his Sinaloa cartel and orchestrate his breakouts. "Indeed, if there were ever a case warranting SAMs, it is this one," prosecutors said. Guzman, 59, was brought to the United States in January to face charges that he oversaw a multi-billion dollar international drug trafficking operation responsible for murders and kidnappings. Since then, he's has been locked in his windowless cell for 23 hours a day with only a radio for company, the defense papers said. His jailers also have violated his constitutional rights by barring him from seeing or speaking on the phone with his wife, so she can help him decide whether to hire a new lawyer, they argued. An anxiety disorder that began during his imprisonment in Mexico has worsened to the point where he "has difficulty breathing and suffers from a sore throat and headaches," the papers said. "He has recently been experiencing auditory hallucinations, complaining of hearing music in his cell even when his radio is turned off." Prosecutors denied that the conditions are overly harsh. Guzman, they said, has the largest cell on the block with a frosted window that lets in sunlight and has lengthy visits by a legal team that's trying to teach him to read and speak English. And they said there's an explanation for the music in his ears: An examination by a jail psychologist "revealed that the defendant had merely been hearing sound from a radio that a staff member . had been playing." Guzman is due back in federal court in Brooklyn on May 5.